It is everything pumpkin time! 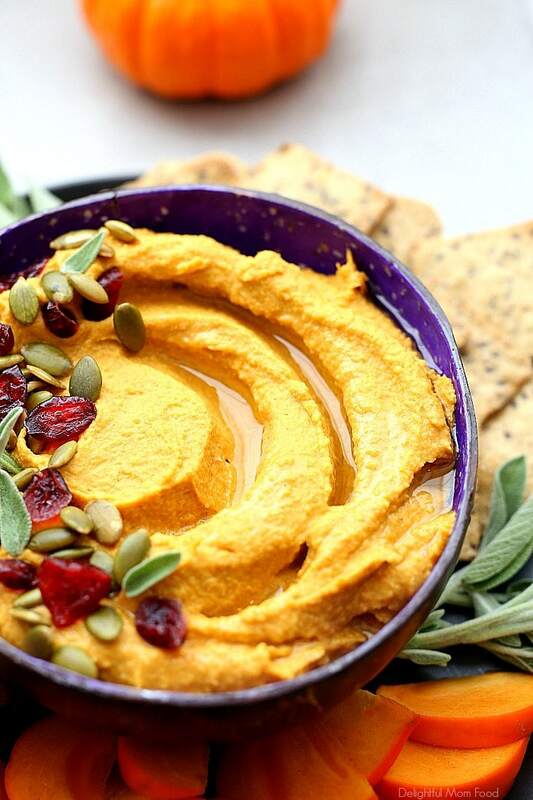 This pumpkin hummus is savory and creamy with hints of cinnamon, cumin and garlic in a tahini chickpea pumpkin puree base. This time of year I can not seem to get enough pumpkin! A few favorite gluten-free recipes are these grain-free pumpkin muffins, pumpkin bread, healthy pumpkin oat breakfast cookies, pumpkin chocolate chip cookies and pumpkin soup (which inspired the flavors in this pumpkin hummus)! 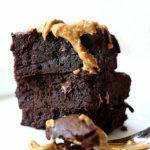 My husband (taste tester) totally approves of this recipe and said it is REALLY good! Pumpkin pureed is delicious in baked goods (also makes them super fluffy!) and raw foods such as hummus. It has a beautiful orange hue that looks so pretty sprinkled with pumpkin seeds, sage, dried cranberries or pomegranate seeds. 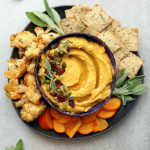 Not only is this orange hummus pretty, adding pumpkin to a classic hummus recipe adds more nutritional value to the dip. Pumpkin is rich in iron and Vitamin A, which helps with oxygenating the blood and protect eyesight. Pumpkin is also high in antioxidants and may protect the body against chronic disease. So… yes please, bring on the pumpkin! We recently had the kids grandmother and great-grandparents over for dinner I decided to serve an early Christmas / Thanksgiving holiday feast, which included this pumpkin hummus recipe. 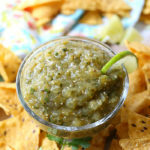 It was well loved by everyone as an appetizer and at the dinner table. 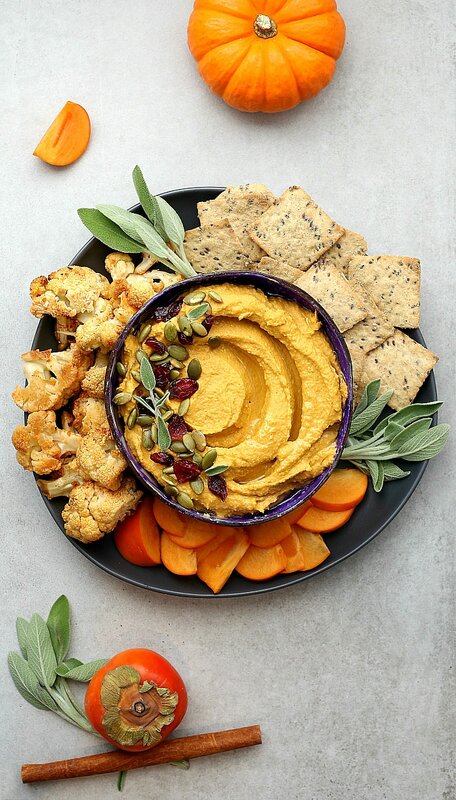 Serve pumpkin hummus as an appetizer: This pumpkin hummus is perfect as an appetizer served with roasted vegetables, persimmons, apple slices and crackers. Serve it in a wrap: Spread a generous amount of hummus in a gluten-free tortilla wrap or brown rice wrap and layer it with turkey, sprouts and lettuce and a drizzle of cranberry sauce. 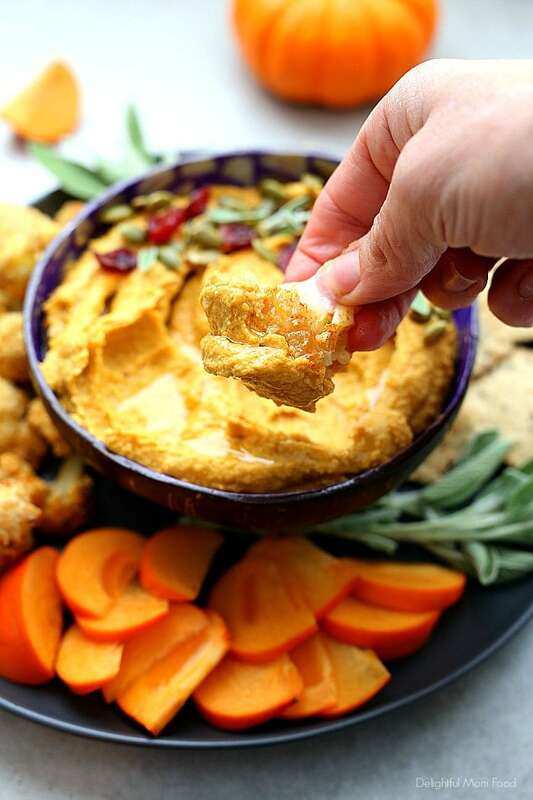 Use it as a dip: Dip your favorite grilled meats in pumpkin hummus. It adds a little bit of sweet and earth notes to grilled chicken or pork. Blend these natural ingredients in a food processor until smooth and drizzle olive oil or avocado oil on top before serving. It literally takes less than 10 minutes to whip together this delicious dip! Hummus is simple to make and incredibly healthy made with natural plant-based ingredients! 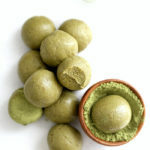 It is naturally gluten-free, vegan and much cheaper to make homemade! Isn’t this gorgeous to add to your holiday table?! In a food processor add the pumpkin puree, chickpeas, tahini, garlic cloves, salt, cumin, cinnamon, and lemon juice. Puree until smooth and fluffy. Scoop into a small bowl and garnish with olive oil (or avocado oil), pumpkin seeds, dried cranberries and sage leaves. Serve with your favorite vegetables, fruits and crackers. For the holidays this is served with fuyu persimmons, roasted cauliflower and gluten-free crackers. You can also add a splash of water to thin the hummus or 1 teaspoon baking soda to give it a more fluffy consistency.